Five talented young basketball players from Akron, Ohio star in this remarkable true-life coming of age story about friendship and loyalty in the face of great adversity. Coached by a charismatic but inexperienced player�s father, and led by future NBA superstar LeBron James, the �Fab Five�s� improbable seven-year journey leads them from a decrepit inner-city gym to the doorstep of a national high school championship. Along the way, the close-knit team is repeatedly tested-both on and off the court-as James� exploding worldwide celebrity threatens to destroy everything they�ve set out to achieve together. More Than a Game combines a series of unforgettable one-on-one interviews with rare news footage, never-before-seen home videos, and personal family photographs to bring this heart-wrenching and wholly American story to life. 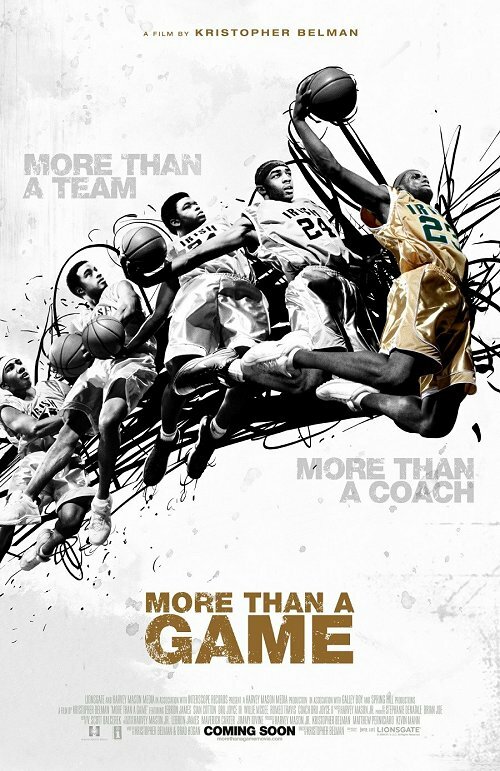 Directed by Kristopher Belman and produced by Harvey Mason Jr. and Belman, More Than a Game tells the true story of five talented young basketball players, including future NBA superstar LeBron James, and their remarkable journey from Akron, Ohio to the national high school championship series. The film is written by Brad Hogan and Belman; joining Mason and Belman in producing are Matthew Perniciaro and Kevin Mann. The executive producers are Maverick Carter, LeBron James, and Jimmy Iovine. Lionsgate will release the film in theaters on October 2, 2009 with expansions on October 9 and 16, 2009. The DVD will be released on February 2, 2010.